Fall is right around the corner, and that means rain will be hitting near your home. While the earth can use all the moisture, the gray skies can get a little wearing. Brighten your rainy season and your home with a few fun umbrellas. If you come into your entryway or mud room and see a bright umbrella and rain boots, you’ll be more likely to skip outside for a little puddle jumping. That’s a whole lot more fun than trudging through the puddles with a black umbrella and galoshes. 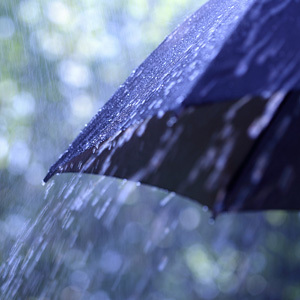 While an inexpensive, dark umbrella from the drugstore will get you through a few storms, you’ll probably have to replace it a few times if the rainy season lasts very long. Why not invest a little more and get something that will last and cheer you up at the same time? There are umbrellas for every style and taste. Many gorgeous, bright umbrellas, including the rainbow color wheel umbrella are available from MOMA on Amazon.com. Many of them are perfect for the artist in your home or anyone who needs something cheerful on a gray day. Marimekko makes umbrellas with bright colors and bold patterns, too. They’re perfect for adults or kids. To make a rainy day a fun day for the kids in your home, find a color changing umbrella. MOMA has several with splotches that change from white to red, orange, green, yellow, blue, and purple when wet. Keep your eyes open for fun umbrellas to lift your spirits and improve the look of the mudroom in your home.